Successfully Added Fortaleza - Quad Band Watchphone in Stainless Steel to your Shopping Cart. Fortaleza, our new quad-band stainless steel weatherproof mobile phone watch with 1 GB of memory, a built-in photo and video camera, media player, all with an easy to use touch screen display. Adding to our industry leading watch phone product range is this new heavy-duty mobilephone watch finished in stainless steel, the Fortaleza. This is a weatherproof phone, meaning you can always have it on your wrist to use in a moments notice. When you have the Fortaleza watchphone, you never miss a call or important text message. It is a quad-band phone, meaning you can use it on any GSM network around the world. You can make and receive calls directly from the watch phone itself with its built-in MIC and speaker, use the wired headest, or the Bluetooth headset. One phone, three choices. 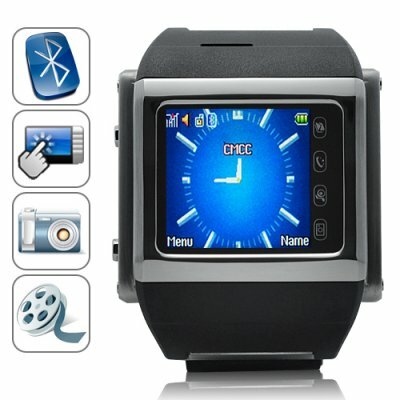 Works as a great digital watch, picture and video camera, MP3 player, MP4 player, and more. The Fortaleza is a ultra-durable all metal model, weighing 192 grams. This is a man's man's watch! A brilliant timepiece combining all the convenience of a digital watch with the rich feature selection of today's media phones, making this the total communication package for light travelers and gadget lovers everywhere! Don't delay, order one of the amazing Fortaleza cellphone watches right away and once you realize how great the quality is, order some as stock in your online store or list as a dropship item to maximize your cash flow. Brought to you by the online leader in direct from China wholesale electronics - Chinavasion. Great all-in-one communication and life device! Is this mobile phone watch as good as the one made by LG? You mean the one that LG announced as an upcoming product this year? We have been making mobile phone watches for over 3 years already. We assure you, not only is the CVSL-104-2GEN better than whatever they will introduce, but ours is 1/3 of the price and comes unlocked and with no contract or hidden fees! I cannot get the 4 fixed shortcuts to work, why? You need to be at the welcome screen for those to work. on 2011-01-23 09:48:40 Great gadget! Excellent work! i was a bit wary about ordering from another country i had paid for my order plus the delivery fee and waited, i tracked my order through UPS and was amazed at the fast delivery of the product. Watch phone I got very quickly. Battery life is fair compared to the other phones. - Just don't apply too much pull stress to the watchband connected to the face - it will break off! - The wired earphone cable should have been reversed faced up instead of down as its a bit difficult to unlock the phone while this is plugged in. I am indeed impressed with ChinaVasion. But one thing that you must consider if you are from the US is that USA's largest carrier, Verizon, will not work with this watch. The reason is that Verizon is primarily a CDMA company and not GSM. Verizon will NOT work with GSM phones. But there are a lot of other companies that will work with GSM phones. So ask your company the key question: are you a CDMA or GSM carrier? My watchphone does everything that ChinaVasion promised me. Their order and delivery process was flawless. I received my order within 4 days. People cannot believe the low price I paid for my phone. Everyone I talked to about my phone is puzzled why these products are not more popular here in the US when they would love to have products like those available at ChinaVasion. I know why. Verizon does not reveal their limitations with their CDMA platform. If US wakes up, they will realize that Verizon is too greedy and wants to monopolize the market. Thank goodness there are companies like T-Mobile, Union Wireless, and AT&T who have the sense to use the GSM network. ChinaVasion has turned me into a believer and I will surely purchase from them again.